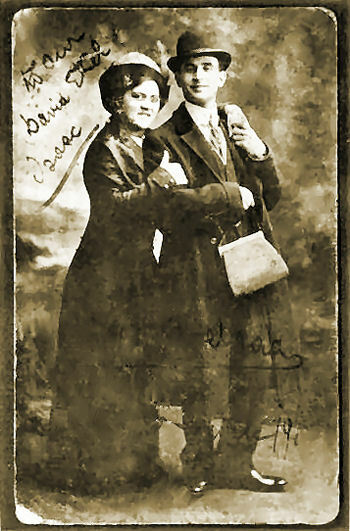 in Iasi, Romania, was an actor and producer in the Yiddish Theatre in London, Paris and Buenos Aires. in amateur Yiddish productions. In the 1890s, Morris moved to London and found work in a hat factory. He subsequently became a professional actor and became a popular comedian on London's East End. Further, Morris' brother David Axelrad became a scenery painter in the Yiddish Theatre and several others in the family followed his lead into the performance end of the Theatre even in America. However, his nephew, Dr. Jacob Weingreen (1907-1995) took a more scholarly route and became the first Hebrew Chair at Trinity College in Dublin and author of a definitive Hebrew grammar entitled "A Practical Grammar of Classical Hebrew." He and his wife Bertha (who was from South Africa) also played a pivotal role in assisting Holocaust survivors. Copyright © 2009 Museum of Family History. All rights reserved. Image Use Policy.